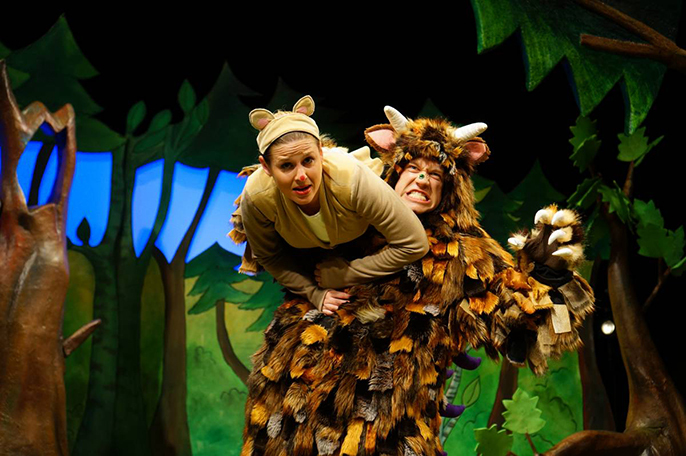 We’ve watched the film and read the book so it made perfect sense to take my toddler to see The Gruffalo Live at Richmond Theatre. It’s a musical so in some ways similar to a panto in its theatre style complete with pantomime style actor to audience interaction. In this 55 minute adaptation of Julia Donaldson and Axel Scheffler’s classic book we join mouse who is in search of nuts but on this magical adventure he encounters a fox, an owl, and a snake making for an interesting, fun filled journey with plenty of catchy songs along the way. Of course with children being the impatient beings they are, I lost count of the number of times I heard a little one say ‘Where’s the Gruffalo?’ or ‘Is the Gruffalo coming on now’. But when he did finally make an appearance, it was worth the wait. He was big and hairy and even does a little stint sitting amongst the audience for those lucky enough to be sat in the front row. My daughter loved this bit and kept trying to escape to go and meet him. If your children are Gruffalo fans then this musical theatre trip into the deep, dark woods by Tall Stories, is highly recommend although, didn’t you know? There’s no such thing as a Gruffalo.